Occasionally remove loose dust from the interior trim, plastic parts and seats using a vacuum cleaner or soft bristled brush. Wipe the vinyl and leather surfaces with a clean, soft cloth dampened in mild soap solution, then wipe clean with a dry, soft cloth. Regular care and cleaning is required in order to maintain the appearance of the leather. Before using any fabric protector, read the manufacturer’s recommendations. Some fabric protectors contain chemicals that may stain or bleach the seat material. Use a cloth dampened only with water to clean the meter and gauge lens. Do not use water or acidic cleaners (hot steam cleaners) on the seat. This can damage the seat or occupant classification sensor. 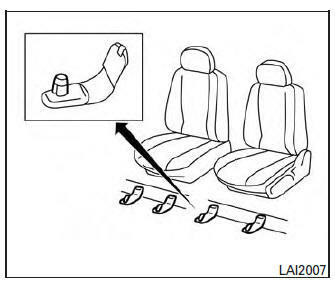 This can also affect the operation of the air bag system and result in serious personal injury. Never use benzine, thinner or any similar material. Small dirt particles can be abrasive and damaging to leather surfaces and should be removed promptly. Do not use saddle soap, car waxes, polishes, oils, cleaning fluids, solvents, detergents or ammonia-based cleaners as they may damage the leather’s natural finish. Never use fabric protectors unless recommended by the manufacturer. Do not use glass or plastic cleaner on meter or gauge lens covers. It may damage the lens cover. Hanging-type air fresheners can cause permanent discoloration when they contact vehicle interior surfaces. Place the air freshener in a location that allows it to hang free and not contact an interior surface. Liquid-type air fresheners typically clip on the vents. These products can cause immediate damage and discoloration when spilled on interior surfaces. Carefully read and follow the manufacturer’s instructions before using the air fresheners. NEVER place a floor mat on top of another floor mat in the driver front position. Use only genuine NISSAN floor mats specifically designed for use in your vehicle model. For additional information, refer to your NISSAN dealer. Properly position the mats in the floorwell using the floor mat positioning aid. For additional information, refer to Floor mat positioning aid in this section. The use of genuine NISSAN floor mats can extend the life of your vehicle carpet and make it easier to clean the interior. Mats should be maintained with regular cleaning and replaced if they become excessively worn. This vehicle includes two driver’s side front floor mat brackets and two passenger’s side front floor mat brackets to help keep your floor mats in place. Genuine NISSAN floor mats have been specially designed for your vehicle model. The driver’s and passenger’s side floor mats have two grommet holes incorporated in them. Position each mat by placing the floor mat bracket hook through the floor mat grommet holes while centering the mat in the floorwell. Periodically check to make certain the mats are properly positioned. The seat belts can be cleaned by wiping them with a sponge dampened in a mild soap solution. Do not allow wet seat belts to roll up in the retractor. NEVER use bleach, dye or chemical solvents to clean the seat belts, since these materials may severely weaken the seat belt webbing. Periodically clean the seat tracks to prevent reduction of ability to move the seats. Clean periodically with a high-powered vacuum cleaner. Dirt and debris may reduce the ability to adjust the seat. A wet cleansing agent may be used if necessary.